Media articles about rheumatoid disease (RD) / rheumatoid arthritis (RA) often imply that there are things people can do to either avoid getting the disease or to lower disease activity. Most of them present helpful tips to alleviate RA. From hand “exercises” to using essential oils to losing weight, you are supposed to walk a cautious stepping-stone path to the safe land of no RA. Honestly, that sounds more like Candyland than evidenced-based medicine. But in truth there is nothing I can tell you—or even my own kids—to do to avoid getting RD / RA. Simply put, while I do believe in fighting back (duh– RA “Warrior”), I am sure that RA is not your fault. There are basically two sides to this debate. Most people who don’t have the disease assume you can avoid it if you do the right things. This view implies that RD / RA may be your fault. Of course most people with the disease know that it snuck up from behind and attacked them like a mugger, even though they often struggle with guilt. I’m obviously on that side. In these ten quick examples, I’ll try to refute some of the common ways people have been blamed for either getting sick or “staying” sick. Living well. People have varied and changing ideas about living right or “clean.” But many people with rheumatoid disease (PRD) have eaten healthy, been physically active, and avoided health hazards like smoking. (Some of us even wear seatbelts.) Meanwhile we know many people who’ve treated their bodies badly without ever contracting a disease like RA / RD. Positivity. Most PRD cooperate wholeheartedly with their treatments—despite the fact that treatments are often ineffective. PRD do this with a positive attitude, hoping that each new treatment may finally be the ONE. My thumbs. I never misused my thumbs or did anything to create their deformity. Honestly, I really did just wake up like this. In fact, I protected my joints because I remember the disfigurements my grandfather suffered. I embraced every treatment, wore a thumb brace, and even got steroid injections in my thumbs to see if it would help straighten the contracted tendons. No success. Babies. When children get sick with RD, it is the most obvious proof that patients are in no way to blame for this illness. No, RA is not your fault either. Science says so. I did just publish a book on the scientific evidence for the systemic nature of RD. The more reports I read, the sillier it seems to blame patients for being sick. Immunology is slowly uncovering the mechanisms of pathogenicity (disease causes). Disease patterns. There is a wide spectrum of patterns of disease activity and progression. And there’s an equally unpredictable range of response to treatments. If researchers can’t even tell who’ll have severe disease or who’ll respond to medication, then how can patients be at fault? Varying triggers. Numerous disease triggers have been explored, including physical trauma such as accidental injury. But no one can tell you just what to do or what to avoid to prevent RD. So no one can blame you for being in the wrong place at the wrong time. “Pick up your mat and walk.” Over the years I’ve seen hundreds of people go back to a job or routine if their disease is less active or they have a remission. It often reminds me of that Bible verse—people just want to get on with life, and they will do so as much as possible. Eventual success. I’ve also watched people suddenly get better with a medicine—including DMARDs or steroids. This would not happen if PRD were just clinging to their old ways or reveling in being sick and disabled. And yet, some will blame me for telling you that… as if by declaring RD / RA is not your fault, I’m giving you permission to be sick. But the disease doesn’t need permission—it attacks innocent victims every day. So I’ve spent the last decade giving people encouragement and information to fight back. For me, it’s only my best friend and my kids who understood that it wasn’t my fault I suddenly had every joint affected by RD. I want my readers to know that they at least have me. I believe in them and I’ve learned from watching them that people do not embrace illness, even if they are forced to accept it. People embrace health and participation in life—and strive to attain it as much as possible. 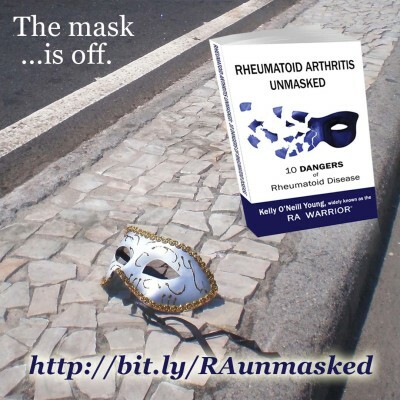 NOTE: This blog post was inspired by one point in Chapter 1 of my book Rheumatoid Arthritis Unmasked: 10 Dangers of Rheumatoid Disease. That chapter discusses what RA is and what it is NOT. If you haven’t purchased the book yet, you can read that chapter with PEEK INSIDE on Amazon. When you buy the paperback of Rheumatoid Arthritis Unmasked, you can now get the ebook version FREE on Amazon through end of 2017. (Perfect if you want a copy to give away, share, or loan out, and one to keep for yourself.) Kindle ebook versions can be read on ANY device with a free Kindle app, which also have search and highlighting options. The Kindle version of Rheumatoid Arthritis Unmasked will be 60% off the cover price— only $3.99 —beginning on Thanksgiving in the U.S., November 23. The sale will last through Black Friday and Cyber Monday November 27. So if you haven’t gotten your copy yet, now is the time. Save 60% off the regular $9.99 price. No Kindle = no problem! The Kindle app is free for any device – click here. There are several advantages to the Kindle version that can be read on ANY device with a free Kindle app: You can put the book on all your devices. The app remembers what page you’re on when you switch devices. You can highlight, bookmark, and search within the text—features that are perfect for referencing info you need in the book. HOW DO YOU KNOW THAT RD / RA IS NOT YOUR FAULT? SHARE BELOW. ← Rheumatoid Arthritis Problems, Anyone? Thank you for reminding me that my disease is not caused or cured by what I eat/don’t eat or what I do/don’t do. I sometimes let people guilt me into thinking that I can do more to get myself better, when I truly am doing all that I can. One of the nicest things that happened to me after I received my rheumatoid diagnosis was a visit to my primary care physician. She looked right at me and said “This is not your fault.” She went on to explain that it was not anything I did or did not do that caused this to happen to me. She had already saved my life by insisting I follow up with a gynecologist when the symptoms I had reported suggested cancer. She was right, and prompt surgery removed the cancer. Ironically, I did not need chemo at that time, but now I have regular infusions to treat rheumatoid and overlapping conditions. What a wonderful story Sandra. Thanks for sharing how out can be. Thank you For all your information. I found your site shortly after being told I had rd in 2015. Other than being told that my condition was incurable from my doctor, all of my early knowledge came from you. Besides knowledge also encouragement the things that were happening to me were part of the disease. Oh Kelly – how I needed this – it isn’t my fault – thank you – as always your words always make me feel included not excluded as I feel with a lot of people. Its such a lonely life with this disease. Please believe me, I know that getting RA is not our fault. In fact, if there’s any fault at all I would say it is in the standard American diet. I was diagnosed in 2009. I am anti-ccp positive. I was on Methotrexate, Humira and Plaquenil for 8 years. In March of 2016 I started eating a plant based diet. A plant based diet is a very low inflammatory diet. I removed all processed food, milk, wheat, and meat. My diet consist of vegetables, fruit, whole grains like quinoa, nuts and seeds. By March of 2017 I came off all my meds with no symptoms. My doctor says I’m in remission. I am not one in a million, but one of thousands that have found relief with this type of diet. Inflammation is at the heart of all disease, especially ours! I have kept up with this blog since I was diagnosed, and I realize that some will say diet has no effect,and I thought that as well, until I committed to eating this way. It has changed my life! Read Dr. Joel Fuhrmans book “Eat to LIVE!” This is not an advertisement, I have never paid for anything except the book and my own foods from the grocery store. In whatever way anyone finds relief I wish them well. I truly appreciate having a source for real information about RD from someone who lives the reality of this terrible unforgiving disease. I was recently diagnosed With Seronegative RA and the first thing I said to the Rheumatologist was my labs were normal and I was too old (67) to have RA. LOL Sometimes denial is the only ally you can find. I went home totally stunned and started an online search for RD/RA info and found your blog. I got your book and read it. It makes so much more sense to look st this as a whole body disease and not just a “hand disease”. In retrospect I believe mine started 10 years ago with the periodic loss of my voice along with wrist and thumb pain. I was diagnosed as having Fibromyalgia and carpal tunnel. I had cortisone shots in my wrists for a couple years and things quieted down. I lost my insurance and ignored my pinky fingers deforming. I am an artist and this last year has been devastating for me. My hands and ankles swelled up and the pain sent me to a doctor. But it took a whole year before I was referred to a rheumatologist. I finally asked for tests and X-rays. It was not easy journey. I’m now on Methotrexate and hoping I’ll be back in my studio soon. Again thank you Kelly from the bottom of my heart. You made me understand the need to self advocate. Loved this post. For the past four days my RD has been nearly unbearable. I was diagnosed at 15, went into remission after gold treatments for 3 years and stayed in remission until my dad died in 2015. I have been through methotrexate, Humira, and now am taking Enbrel. Honestly, I can’t tell I’m taking anything. So now that my small vent session is over, I have a question. I have been doing PT for the past two weeks. I go three times a week. The PT is for my neck and shoulders. Sometimes I feel really sore from the PT and sometimes I feel better. Sometimes I swear what they have me do aggravates my shoulder joints, and gripping bands and hand bikes certainly do. So what am I supposed to do about my hands and wrists in therapy? They hurt when I do doorway stretches. They hurt when I grip the handle for the bands. They hurt when I grip the hand bike. They hurt so much for the littlest things. Any advice? Also, would you go to a doctor that didn’t treat fibromyalgia and who does not prescribe pain medication, and instead outsources you to a pain management doctor for it? I’m still not happy with the doctor I have. I want an accessible doctor. Is that too much to ask? I sometimes wonder if they know the type of patients they see everyday. Anyway… I love this site. It has kept me going. Sometimes it is hard not to just fall into despair. I know that sounds dramatic, but this disease is dramatic. It steals things away from you. Slowly and painfully, and although it may not sound like it, I DO have a positive attitude. I go to therapy because I am hopeful, I take Enbrel because I am hopeful. I go to appointments because I am hopeful. But I’m let down again and again. Thank you so much for this article. 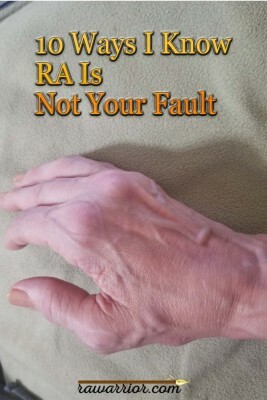 For many years I have blamed myself for having RA. 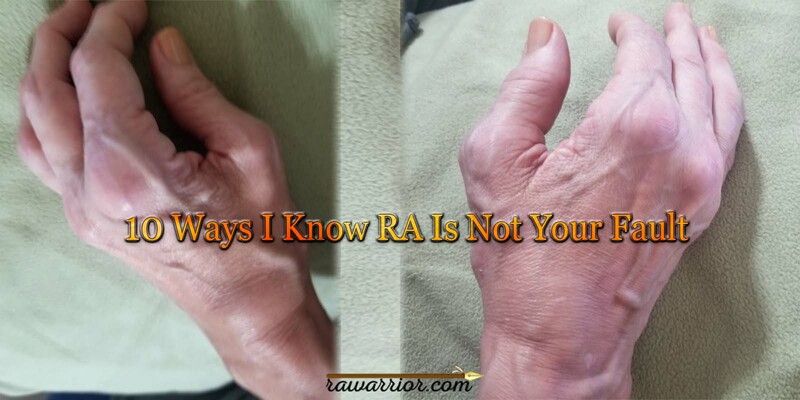 People have shamed me for having RA. I blamed myself for not handling my abusive marriage better. It created a tremendous amount of stress which may have led to the RA surfacing. My fraternal Uncle had RA so it’s already in my genes. That certainly isn’t my fault. Our body does work in strange ways. People, who have never had a smoke in their lives, suddenly get diagnosed with lung cancer. Genetics have a part to play in rheumatoid arthritis. This autoimmune disorder, sometimes get triggered due to certain genes associated with chronic inflammation or immune system, present in our body. You are right to say, that RA is nobody’s fault. I’ve been in here all day! Here being RAW blogs/links. I am 52 dx’d @ 28. Heavy sigh. Currently, I am peeling back some layers in the emotion/mental health area. It’s a mess! I do believe I caused my RA·RD. Although ..(always the what about ·isms begin!😊😄) I did get very very flu sick before I was dx’d and had always read some strep-b connection to RA. I’m not really into all the research..bc I get very overwhelmed and I tend to just “neg” things as a natural response. Another reason why ‘peeling the onion’. So, I end at the conclusion that there is no real cause or fix for RA and it cannot be known to us.NOTE: I am kinda in the ‘looking at life from 20 billion miles away’ perspective -another onion layer! So, thanks for helping me peel and examine the onion. It’ll all work out in the end- one way or another. I’m gonna be more open to my life, my joy. Peace to you and yours and all reading this! Hello. Your post was very honest, and I appreciate it. I was diagnosed with ra a little over a year ago. Having flare ups often now, leaving me unable to go to work. Not taking any meds, but fear that is in my future. Scary. Unknown. Hit me out of the blue. Please know you are not alone. I empathize. Take care. Thanks Kelly for another good article. I was diagnosed in 1999 with RA and am grateful to still be here. This disease takes no prisoners! This british doctor was writing in the press (I live in Manchester), that RA patients should exercise more and stop being lazy. I was furious and wrote to him “How can you exercise if you can hardly walk? Thanks Kelly for encouraging us all to keep +ve and warring on. I was recently diagnosed, like last Thursday. I have Type1 diabetes. I also have thyroid disease and take synthroid. I’m wondering if diabetes just makes you vulnerable to other autoimmune diseases?